Dessert today is brought to you by those end-of-fall sweet, juicy, ruby red apples that are just completely irresistible. Organic Honeycrisp, I’m looking at you. 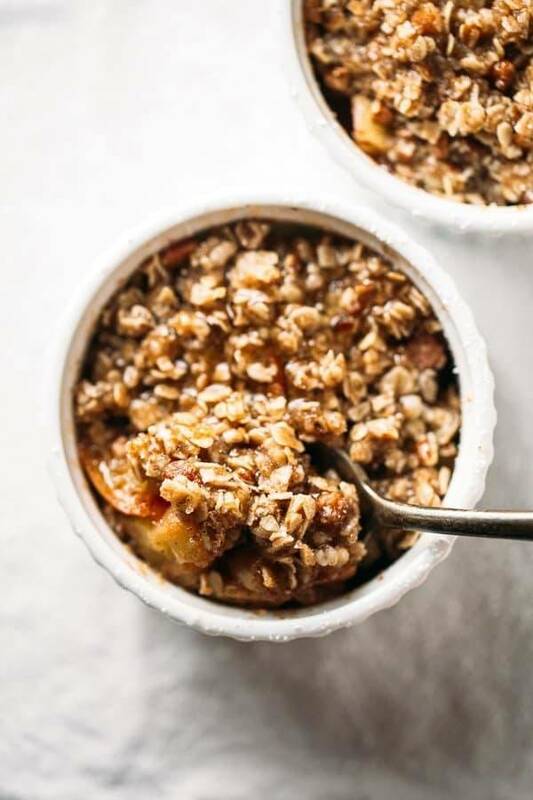 Today these apples are coated in cinnamon sugar and conveniently topped with a healthy, wholesome crumble that is made with oats, pecans, whole wheat flour, and coconut oil. I don’t even like coconut oil. Except now I do. FLIPPING OUT. Five minutes to snacky apple deliciousness = five minutes to happiness in my house. I say house, but ohhh hi again. We’re still living in the basement. I wish we had an awesome video update for you this week – something like me knocking down (ahem, poking holes in) a wall or something – but the most exciting kitchen event this week was yesterday afternoon when the plumbing company dropped off the sink so it could sit in a cardboard box for another week. Countertop fairies, please sprinkle your speedy fast dust on our fabricators. Annnnd you know you’re an adult when: you talk about countertop fabricators in normal conversation. Hi, Mom! As you might recall, in the basement we are lacking that one magical food box called the oven. Sad face times one thousand. I miss it a lot. And I’m already dreaming of baked everything when the new oven comes in next week – T minus eight days, not that I’m literally counting days and hours and minutes or anything. Just get your party pants ready. But the big, exciting news today is that I STILL MADE THIS WITHOUT AN OVEN. This five minute single serving apple crisp is a minimal commitment, low maintenance, ready super fast treat for all the Regular Days. And you probably already went there in your mind, but just in case you need some help, this super speedy apple crisp can serve as a snack, dessert, or breakfast –> I just said that. Five Minute: Yes. These adorable minis are whipped up in two minutes and baked in three. And when I say baked, I mean more like gently warmed in the microwave. You guys. Mixed feelings. I don’t love microwaves. I sort of loved the purist approach we took in the Philippines when we chose not to have a microwave for a year. And purist is interchangeable with cheapskate. But seriously, I had always sort of hoped that there would be a time in my life when I wouldn’t have a microwave and CHECK! We took care of that one. Now we temporarily don’t have an oven, and as much as I dislike the idea of every warm thing I’m eating coming out of that black zapper box (it’s just one of those thingssss), it’s super super convenient and we would be sad and hungry without it. The microwave gives us the moment of crumbly bliss that is these five minute mini single serving apple crisps, and for that we say Major Thank You, Microwave. Single Serving: So I wrote the recipe to be enough for two servings, which sort of makes the title of single serving a little white lie, but here’s my rationale – if I was going to make this for a snack for one person (meeee) I might as well just make two of them so I could eat the second one in a few hours when the oats-and-apples-and-cinnamon-sugar craving strikes again. Also, I find it semi-annoying to measure teeny tiny amounts of things and making this for two helps that cause. And plus, the second leftover apple crisp is as good if not even better than the first. SERIOUS. It has time to sit and jive together with that coconut oil and cinnamon and get all soft and yummy and it gets to be baked twice. 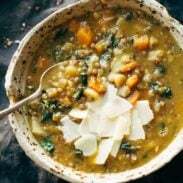 It is ten hundred percent cozy and delicious, and guess what? It’s already ready to eat since you made two of these to begin with. Awyeah. Apple Crisp: I am having a love affair with the crumbly topping, and even more so when it’s heaped over those bubbling cinnamon sugar apples. But what else is new? The topping here reminds me of the one we made for that blueberry crisp this summer. 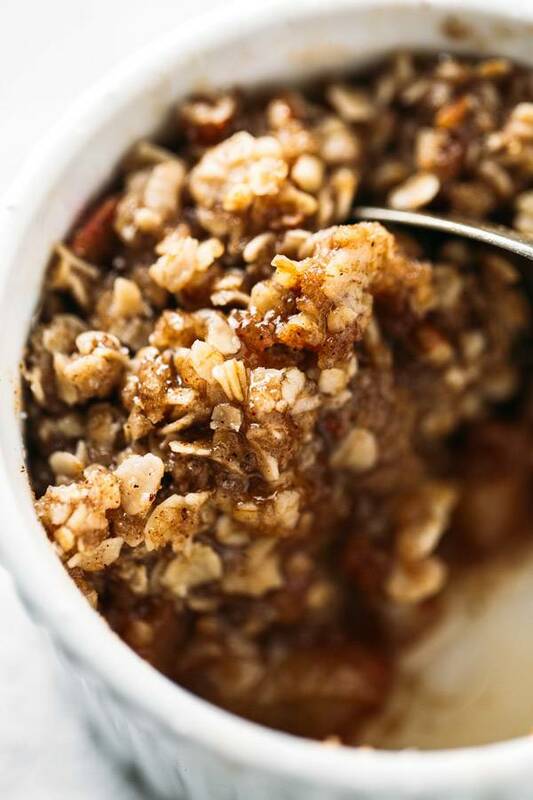 It’s simple and wholesome: oats and nuts and a tiny bit of whole wheat flour mixed with a little crunchy turbinado sugar, some spicy-warm cinnamon, and a scoop of coconut oil. The thing about coconut oil and me is, like, usually, just no thank you. But I tried this apple crisp several times side by side using butter and coconut oil, and my tastebuds betrayed my prejudices and fell more in love with the coconut oil one than with the butter one. No, I know. It’s blasphemous. But I speak only in truths, and I would not tell you to make it with coconut oil just to be Trendy Food Blogger, because let’s face the facts: trendy is not anywhere in my life’s vocabulary. I firmly believe in loving the food you eat, especially your sweet snacks, and LOVE might be an understatement for how I felt about the wholesome coconut oil, pecan, and oat topping on this joyful lil apple crisp. I sort of feel like I should apologize for the random weirdness of this recipe, being that it’s made in the microwave and all, but no apologies needed, right? Because I truly loved this and the fact that it warmed me right to my toes and gave me a reason to take five minutes and sink a little deeper into my spot on the couch with a candle and a blanket, and I think you, in the middle of your busy, no-time-for-the-oven-days, will love it right along with me. Sometimes one little individual serving size apple crisp just makes the day so much more manageable. Go take five minutes and make this for yourself. Remember what I said about breakfast? I wasn’t kidding. Five Minute Single Serving Apple Crisp with a wholesome oat, pecan, and coconut oil topping. Made super fast in the microwave! No oven required. Melt the coconut oil in the microwave. Stir in the oats, pecans, 2 tablespoons of the whole wheat flour, 2 tablespoons of the sugar, 1/4 teaspoon of the cinnamon, and the salt. Mix until well combined. Chop the apples and toss them with 1/2 tablespoon of the whole wheat flour, 1/2 tablespoon of the sugar, and 1/4 teaspoon cinnamon. Layer a little spoonful of the oat mixture in the bottom of two 9 ounce ramekins or mugs. Top with about 1 cup of the chopped apples and heap the remaining oat mixture over the top. Microwave for 3 minutes and 30 seconds – the apples should be bubbling and the whole thing will reduce in size. Remove and let stand until cool enough to eat. Be careful because it’s going to be really hot at first! Also, the texture improves as it rests and cools. Drizzle with honey for an extra gooey kind of texture. Yum! You can make both at the same time and then save the second one to reheat later. I just wrapped it with foil and left it on the counter for the next morning (any longer than 12 hours and I would put it in the fridge). I actually preferred the texture of the second one even though it’s “day old” because the oats are little softer. Awesome how you made this without an oven, and living in the basement and all. Love how your sink was delivered but can see how it’s inconvenient too. Getting a sink was exciting during our remodel, too bad my husband allowed the delivery boy… well man?!? ….whatever to drop it right in front of our main door entrance and so no one could get inside the house without hopping over it. That sink was a beast too, huuuuuuge. One of the Farm sinks you see, the one big basin instead of 2. This was especially fun when I was trying to bring in groceries. And it remained there for 2 weeks. Ahhh, the joys of remodeling. Oh my goodness. Seriously. Ours is set off to the side of the cabinets in the same exact spot that the guy dropped it off… and it won’t be moving until install day! Most DEFINITELY no apologized needed. Like none. Nada. Zip. Zero. You get the picture. Apple crisp is a classic that is always full of warm and cozy nums, and now I can eat it for breakfast, it’s healthier and I can have it in 5 minutes. I am gonna marry it. Pinned! MARRY IT. Do it. I dare you. Cannot wait to see the end results of your kitchen remodel (and live vicariously through you)! That’s the one room in my house that makes me wish I was not a renter. Winter in Arizona! HA HA. I can’t get over how easy this is!! So yummy. Or should I just use the oats & leave the nuts out entirely? I have a bunch of apples to use up & hubby is home sick today so I think he might appreciate this warm goodness! Actually I sort of love the idea of peanuts in here. Good call! I secretly (not so secretly?) LOVE that this involves a microwave. My boyfriend is 100% anti-microwave and I sneak around and use it when he’s not home, to avoid getting “that look.” So this is what I’ll make next time he’s out for the afternoon, yay! Oh holy dangerousness! Desserts should be incredibly involved and laborious and tiring so that I make them less. Five minutes to sweetness is never a good idea. Except that it IS a good idea. And at least this is just one serving! I’m a coconut oil convert, I really like it in my tea! Honeycrisp=perfect. Except I bought some from a store and they tasted 50% less awesome than the ones I get from the farm. Me–>spoiled. In your tea?! Wow. Never woulda thought. Yummy! Hope you liked them Jen! This looks amazing! =) Dessert for breakfast = YES PLEASE! Uhh YES to these, 5 min and apple crisp? Done and done! I’m still on the fence with it most of the time, but getting warmer…. This is perfect. I can’t wait to see the results of the kitchen remodel!! Mmm perfect to make in a college dorm room! Looks delicious and totally better than microwave quality. This WOULD be perfect for a dorm! Good call! WOA – THIS is from a microwave??? No way!!! Next week I’m solo since my husband will be on a business trip. Maybe I’ll skip dinner and make this instead. Yum! My microwave broke about 6 months ago. I haven’t missed it and don’t plan on buying a new one; HOWEVER, this recipe alone makes me want to go buy a microwave right now. haha! yes, that’s the one thing I was missing here! You had me at 5 minutes! I LOOOVE warm desserts. Yummmy.